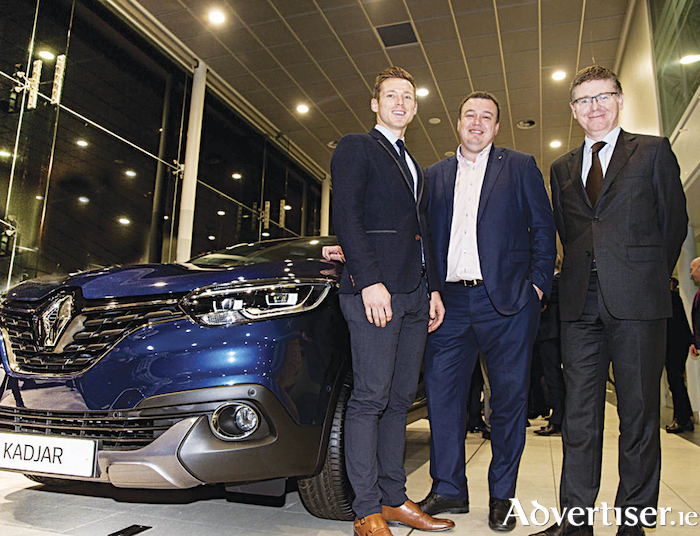 Picture (L-R) at the announcement were Paul Flynn (CEO of Gaelic Players’ Association), Patrick Magee (country operations director of Renault Group Ireland), and Tom Ryan (ard stiúrthóir of the GAA). Renault Ireland is the new official car partner of the Gaelic Athletic Association (GAA ) and Gaelic Players’ Association (GPA ) for the next three years and the title sponsor of the 2019 GAA World Games. The three-year deal cements Renault’s ongoing support for the GAA on and off the field. Patrick Magee, Renault Group Ireland, boss told us: “We are delighted to become the official car partner of the GAA/GPA and the GAA World Games and look forward to working with the association and the players over the next three years. Existing Renault GAA brand ambassadors include former stars: Dublin footballer and three times All-Ireland champ, Alan Brogan; Kerry footballer and five-time All-Ireland medal holder, Marc Ó Sé; Westmeath’s Sunday Game pundit, Dessie Dolan; All-Ireland winning Kerry footballer (and later Irish rugby captain ) Mick Galwey; plus All-Ireland winning Clare hurling captain, Anthony Daly.